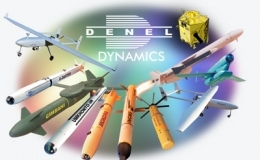 Denel Dynamics is upgrading and improving its range of air defence, air-to-air and anti-armour missiles as it continues developing its product line and focus on future missiles. The Umkhonto naval surface-to-air missile has been sold to three users, including the South African Navy, Finland and an undisclosed customer. Denel is planning to deploy the Umkhonto in the ground based air defence system (GBADS) environment and has recently tested the weapon from a ground based launcher, destroying targets at a range of 20 km, an improvement of 5 km. A ground based version would incorporate a Reutech radar and Denel command post and launcher. Tsepo Monaheng, CEO of Denel Dynamics, said there was interest in air defence, with expressions of interest from countries in North Africa, Asia, the Middle East, South America and Eastern Europe. In order to increase the range of the Umkhonto, Denel Dynamics plans to develop the Umkhonto EIR (Extended Range, Infrared) missile and the Umkhonto LR (Long Range) is under discussion with partners. The company is exploring new generation motors and other technology for the EIR version as well as radar seekers planned for the Umkhonto LR. Ultimately Denel Dynamics wants to put a radar seeker onto the Umkhonto and give it a range of up to 60 km. Denel Dynamics is also directing technology at warheads for surface targets for Umkhonto and aims to develop a surface target version with a 30 km range. On the A-Darter air-to-air missile front, Denel Dynamics is planning improvements for this weapon, including extended range and targeting. An A-Darter Mk II would feature improved acquisition, target tracking and countermeasures upgrades while an A-Darter Mk III would feature a mid-life update (MLU). At the moment the A-Darter is in its final development stage before production begins next year for service entry in 2016 with South African Air Force. The A-Darter is aimed to be fitted to both Gripen and Hawk aircrafts of the South African Air Force. Denel Dynamics is working on a technology demonstrator aimed at an air-to-air version in the 80-100 km range class weapon with a radar seeker. It will also be developed into an all-weather surface-to-air missile. Common subsystems will be used for the different variants of the weapon. Flight testing is scheduled to commence mid-2015. Development has been assisted by using technology and expertise from the A-Darter and Umkhonto projects. On the land side, Denel Dynamics is exploring different launch platforms for the 5 km range Ingwe anti-armour missile and is developing a man-portable launcher. The aim is to have a missile that can be dismounted from a vehicle and fired from a tripod. This would make it more versatile. Denel Dynamics is currently busy with Impi, a smaller derivative of Mokopa suitable for light aircraft such as unmanned aerial vehicles. Impi will most likely be a laser-guided missile. Denel Dynamics has developed the Al Tariq bomb kit in conjunction with Tawazun Dynamics (joint venture company with Denel Dynamics) from the United Arab Emirates. This can be GPS guided or home on a laser beam.